Assessments: Assessments should be designed to measure student learning, understanding, and application of content. These assessments can be quick formative assessments, or they can be summative assessments. Evaluation of these assessments, or "grades", should accurately reflect student learning, understanding, and application of this content. The purpose of "grades" should be for teachers to provide students with constructive feedback and an opportunity for them to self-reflect on their learning. Moreover, we as teachers should assess students not only on what they know, rather, we should assess students on what they can do with what they know. Knowledge of content is important, but application of that knowledge, is equally important. Rubrics: In order to provide constructive feedback for students, teachers should create rubrics for project-based learning assessments. Rubrics should provide clear, concise expectations of the project and should include examples, if needed. Teachers should not only write, or type feedback on the rubrics, but they should also have a discussion with the students, providing verbal feedback. 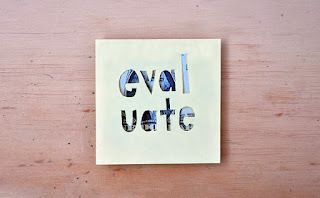 Teachers should also follow up each project with a reflection activity. This provides students with an opportunity for them to self-reflect on their assignments, and on their own learning. Here are two great resources for assessment ideas other than tests. Grades as Punishment: Grades should not be given to reflect student behavior. Moreover, grades should not be given at all. All grades should be earned by students, not given by teachers. Giving a student a "0" is not an accurate measure of what the student knows and is able to do. A zero indicates that the student has absolutely no knowledge and understanding of the content. If a student does not take a test, or fails to turn in a project, there is no "assessment" taking place. A teacher is not at liberty to assign the student a "zero" because he or she has no way of measuring the student's learning and understanding. A better solution would be to either suspend the grade until the student either makes up the assignment, or until the teacher finds an alternative assessment for the student. Either way, the teacher should not assign a zero for missing assignments. It is ultimately the responsibility of the teacher to find a way to accurately measure the student's learning and understanding. The Zero Effect: Students who receive a grade of a "0" have very little chance of bouncing back from this extreme detriment, especially if the "0" is on a test or a major project. No matter how hard a student works to bring his or her grade up, the student will more than likely not get higher than a "C" as an average for the class. Students realize this, which reinforces the lack of motivation and is counterproductive in nature. How is it that in the most widely accepted grading policy, a student who does not come to school at all and receives a 0 is equivalent to the score of a student who masters nearly 70% of the content. In both of these cases, the two students would receive the same letter grade, an "F". Does this accurately reflect student learning and understanding? Intelligence and Talent: "Students should be assessed on their effort, not on their final product. Kids who are praised for their intelligence end up caring more about grades, trophies, and awards than those who are praised for their effort, according to the famous 1998 Stanford report 'Effects of Intelligence and Effort Praise' by Claudia Mueller and Carol Dweck. The study showed that “after failure, [kids] also displayed less task persistence, less task enjoyment, more low-ability attributions, and worse task performance than children praised for effort.”  Teachers who assess students on final projects, alone, set their students up for failure, because when these students fail at a task, it becomes more difficult for them to persevere and bounce back. What is your philosophy on assessment? Do you have a homework policy? Do you assign zero's for missing assignments? I encourage all comments and applaud any feedback that you would like to submit. Because after all, it is also very important for teachers to self-reflect and evaluate their own teaching from time to time. The Zero Effect....what do you do when a kid doesn't turn in work and therefore, gives zero effort. Shouldn't there be a zero effect for zero effort? Thank you so much for your comment. There are a lot of teachers that feel the same way you do. My suggestion would be to have the student stay in during lunch/recess or after school to complete the assignment. If that doesn't work, other privileges can be taken away from the student until he or she completes the assignment. Or, an alternative assignment can be assigned to the student based on his or her specific learning needs.